How can we re-imagine and renew a 500-year-old, text-based, Euro-centric tradition so it remains relevant in our digitally mediated, multi-cultural, globally connected age? How do we balance the best ideals of the past with the constraints and challenges of contemporary higher education? The teacher-scholars who make up the Jesuit Conference on Rhetoric and Composition (JCRC) come together around these questions through a consortium that evokes the Jesuit notion of collaborative process, “nuestro modo de proceder” – listening, sharing and attending to both what is common and what is unique about our distinct institutional contexts, then moving forward together. Our goals revolve around the promotion of rhetoric and composition on our campuses, where we serve as educational emissaries for the continued integration of Jesuit values into contemporary pedagogical practices of writing. Collectively, we share a desire to reclaim rhetoric as a tool for transformation, and we wrestle with ways of promoting meaningful change for the individual learner and in our communities. Anyone who identifies as a writing scholar or instructor across the AJCU network is welcome to join the Conference; we have representation from most of the institutions. We also invite Jesuit-friendly colleagues who have either been educated or employed at Jesuit institutions and remain interested in ongoing conversations about rhetorical education. We support each other in our local tasks through the sharing of information about our individual programs, consulting about everything from drafting learning outcomes and goals, to setting enrollment caps on writing courses. As scholars, we collaborate on projects for conference presentations and publications with the goal of moving our work from the margins into the mainstream of conversation in our disciplines. The group was started more than fifteen years ago as a means to recover the rhetorical tradition that the Jesuits called Eloquentia Perfecta – to understand the intentions of the practices and the evolution of the concept as the Order expanded its missionary reach and developed education as one of its ministries. There is a realization that much of this history was lost or distorted, and members of the JCRC have published many pieces that do the work of recovery. 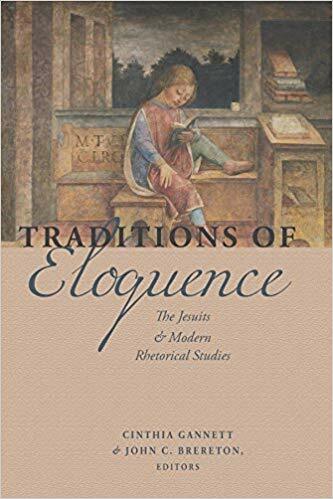 The most notable project conceived and completed by the group is the collection, Traditions of Eloquence: The Jesuits & Modern Rhetorical Studies, edited by Cinthia Gannett and John C. Brereton (Fordham University Press 2016). The book takes the position that rhetoric was never meant to be contained by disciplinary expertise. As imagined by the Jesuits, rhetoric was meant to be "trans-discipline, a means of paying close attention to language, to making meaning, to connecting ideas with words across academic and social contexts." The text is a vital first step in demonstrating that what we sometimes think of as a stolid, rigid tradition, never was, nor is it meant to be now. There is much more scholarship to be undertaken if we are to unravel the complexities of the past, uncovering the ways in which Jesuit ideals inform contemporary practices. Although much of our communication takes place online through a listserv, we truly value our face-to-face conversations with each other. Our official meetings demonstrate this, as they are usually informal affairs – served with a side of eggs. We meet over breakfast at our discipline's major conferences: the Conference on College Composition and Communication, or the conference of the Rhetoric Society of America. In this collegial breaking of bread and consumption of much coffee, we are able to reconnect across distances, report on our personal and professional accomplishments, offer advice on addressing local issues, and raise common cross-institutional concerns. We also continue the collaborative processes of further research and scholarship, making our plans to propose panels and create the kinds of conversations that move the overall goals of the group forward. In 2018, our voices were heard at the two major conferences mentioned above. We also had a significant presence at the Conference on Religion and Rhetoric in the 21st Century, held in Knoxville last October. Paul Lynch (Saint Louis University) was co-chair of the steering committee that made the conference a reality. Pat Bizzell (College of the Holy Cross) was featured as a keynote speaker; Cinthia Gannett (Fairfield University, professor emerita) and John Brereton facilitated a multi-day seminar focused on Jesuit rhetoric; Lisa Zimmerelli (Loyola University Maryland) led a seminar on feminist historiography and religion; and several more of us presented papers as part of the conference program. (And of course we held a lunch meeting – rhetoric and salad.) Plans are in the works for another collaborative presentation at the 2020 Writing Innovation Symposium to be held at Marquette University. This event, scheduled for January, has the theme of "Just Writing" – a topic that goes to the heart of the ethical and spiritual legacies of Eloquentia Perfecta. Each opportunity to work together allows us to put into practice the energizing, and sometimes humbling, pedagogies we champion. Our working together gives us the space to transform the culture of writing and communication on our campuses – to talk about the legacy we have inherited as being dynamic, cross-disciplinary and activist. As the breadth of our understanding about Eloquentia Perfecta increases as it relates to writing and the teaching of writing, we also find intersections with other Jesuit concepts such as accompaniment and discernment, which inform our relationships with our students and with each other. At moments like this, we realize the dual maneuvering of Jesuit rhetoric, which asks us to consider the interior motivations of what becomes our public presentation. We view rhetoric as the vehicle through which the aims and goals of a truly humanistic education, one that includes integrated learning and supports the whole learner, can be achieved. Laurie Ann Britt-Smith is the Director of the Center for Writing at the College of the Holy Cross.